A lot of terrible things have been happening all over the world recently. European unrest grows by the day, while America is two-sided over many pressing issues. The regurgitation of semi-newsworthy stories is everywhere on social media, and conflict between each different view continues to grow. 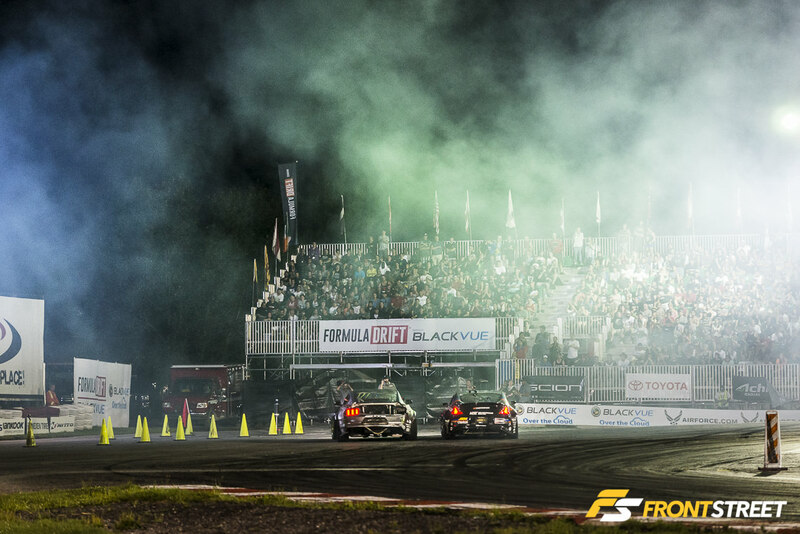 It was a breath of fresh Canadian air to disconnect, have no cellular service, and attend the fifth round of the domestic Formula Drift (FD) Pro championship for some motorsport fun in Saint-Eustache, QC, Canada. 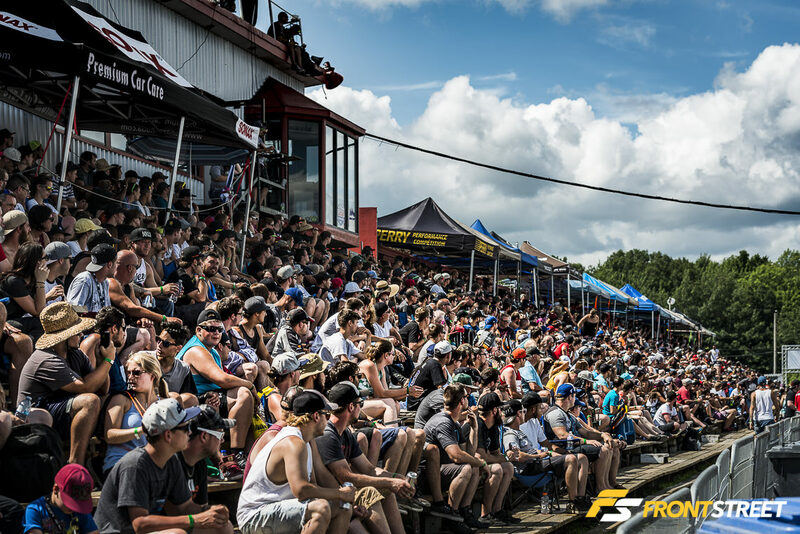 The newly included True North stop of Formula Drift found its home at the Autodrome Saint-Eustache, a facility that just 12 years ago was the first Canadian racetrack to host a drifting event. In the time since, this 0.4-mile oval venue has grown to become the home of Canadian drifting, with the track’s owners not only hosting grassroots and professional events but also managing the entire Formula Drift Canada series. The track layout features a long sweeping first turn entry into the course, where the drivers had to shorten their proximity to the wall for a higher score from the judges. This section is followed by the main straight, where the competitors needed to manji drift – a slalom-like transitional swaying drift from one side of a straight to another – past the clipping point in the middle of the track. The course continues, opening up into a series of infield turns to finish out the run back at the other end of the track. In order to test the limits of grip, each competitor lined up for their turn to practice their hand at the new stop on the FD calendar. Matt Field – in his Driftcave Motorsports S14.5 Nissan 240SX – crept eerily close to the surrounding wall during his morning practice run against Mad Mike Whiddett, driving the RADBUL v2.0 Red Bull-sponsored Mazda MX-5 Miata. The rest of the drift pilot field managed to navigate the skinny transition located on the track’s front straight. As you may know, Front Street’s parent company is Turn 14 Distribution. It was a treat to see the company’s sponsored driver, Dai Yoshihara, comfortably tear through the straightaway in his right-hand-drive converted Subaru BRZ even though it was his first time driving on this track. As practice ended, the round of 32 competition began and the incredible matchups started immediately. Another Turn 14 Distribution-sponsored driver – Geoff Stoneback in his Nismo 370Z – had a series of intense tandem battles with rookie driver Andrew Gray in his DriftEbisu.com Toyota Mark 2. Stoneback laid down consecutive strong runs and ended up progressing into the next round, leaving Gray in his tires’ smoke. Issues plagued the RADBUL team, which forced driver Whiddett to record low qualifying scores earned the previous day. This pitted him against the third-place qualified Feal Suspension Hyundai Genesis driven by Aurimas ‘Odi’ Bakchis. With the car setup still lacking, Whiddett clipped the wall on his lead run and handed the win to a solid pass from Bakchis. The round of 32 continued with tight encounters between the sport’s top professional drivers. Many of them needed One More Time (OMT) rulings from the judges to showcase a clear victor, while others removed themselves from competition due to unfortunate mistakes. The best example of these mistakes came during the matchup between Vaughn Gittin, Jr.’s Monster Energy/Nitto Tire Ford Mustang and Michael Essa’s Loud Mouth Exhaust BMW E46, where both drivers initiated their drift too aggressively and made separate contact with the wall. Gittin’s rear contact removed some of the car’s bodywork, but bumped him in the right direction to continue his drift, while Essa’s contact forced his nose directly into the wall. In the process he damaged something in the front end of the Bimmer and was unable to continue the run, granting the win to Gittin. The intermission break gave the 10,000-plus fans in attendance a chance to walk down the row of vendors and see the pit area for their favorite drivers. Once the break ended, the Top 16 drivers lined up for their introductions to the crowd under a darkening Canadian sunset. The first few battles of the Top 16 were decided by driver error, advancing the more consistent driver in each pairing. That is, until the faceoff between Alec Hohnadell’s Enjuku Racing S14 Nissan 240SX and Chris Forsberg’s NOS Energy Drink Nismo 370Z. This was one of the – if not the – most impressive drift pairings I have ever seen in person. Both drivers were pushing the absolute limits of their vehicle’s setup, as the two V8 engines were pegged on their rev limiters for nearly the duration of the battle while the drivers were operating within inches of each other. Their emotion and desire to win was almost tangible; to the fans’ delight – and my own – the judges ruled a One More Time, which forced at least one more chance to declare a winner. The all-Mustang combination of Justin Pawlak in his Roush Performance Ford Mustang, and Vaughn Gittin, Jr., allowed the combined 2,000 horsepower of Ford V8 engines to roar through the Canadian atmosphere – until Pawlak made contact with Gittin, forcing a spin in the latter stage of their run. Although it seemed like Pawlak was able to carry more speed than Gittin through the turn, the judges deemed the contact to be Pawlak’s fault and Gittin progressed onto the next round. While Great 8 competition had begun on track, the exciting OMT of Forsberg and Hohnadell from the Top 16 still needed a decision. For their second showing, the duo continued their incredible performance, with both drivers touching the inside clipping point cones at each turn, sending the markers soaring spectacularly into the air. Their precision driving made for the best spectacle of the night, and Forsberg was able to leave Hohnadell behind on his lead run, advancing the 370Z into the Great 8. The number one qualifier from the previous day, Forrest Wang, had pushed his Get Nuts Laboratory Nissan Silvia flawlessly through the competition until he over-estimated the speed he carried into the second sweeper of the course against Bakchis’ Hyundai. This made Wang fall behind; he couldn’t close the gap, advancing Bakchis into the Final 4. Fresh from his bout with Hohnadell, Chris Forsberg carried the momentum into another strong showing. As the darkness crept over Great 8 competition, Forsberg took on the challenge of winning against his long-time friend Ryan Tuerck in the Gumout Toyota 86. The matchup of Dai Yoshihara in the Turn 14 Distribution Subaru BRZ and Vaughn Gittin Jr. in his Monster Energy Ford Mustang under the lights looked to be a great combination of skill and speed between the two veteran drivers. Unfortunately, Yoshihara’s Subaru suffered mechanical issues, forcing his retirement from the race. Final 4 competition continued through the night, and despite a valiant attempt to take down the Rockstar Energy Scion tC of Fredric Aasbø, Odi Bakchis just couldn’t keep up with the outright speed and precision of the Norwegian driver. Forsberg looked incredibly solid in each of his battles all day; he needed just one more win against another long-time friend – and fellow Drift Alliance team member – Vaughn Gittin, Jr. to progress to the finals. Once the smoke cleared from their runs, it was Forsberg’s 370Z that moved on to the final tandem of the night. In a final battle of previous champions, the pair of Aasbø and Forsberg kept their cars close; each pushed aggressively in an attempt to outperform their competitor. With the final battle concluded, the French loudspeaker announced there would be a winner. As the final three assembled on the track just in front of the grandstands, they ruined one last set of tires for the night in a display of showmanship for the Canadian fans that stayed to witness the finals. The Norwegian Hammer – Fredric Aasbø – ultimately took the win, gaining more championship points as he now tries to dethrone consistently tough points leader Vaughn Gittin, Jr. It was the perfect outlet for me to witness such strong competition away from all the other global tensions of life. If this stop is any evidence of the kind of competition that will take place throughout the remainder of the season, the next Formula Drift round in Seattle should prove to be one for the record books!